Login Forgot your User ID or Password? Register to access online services. Save money with lower interest rates. Just transfer your outstanding balance to Tata Card. 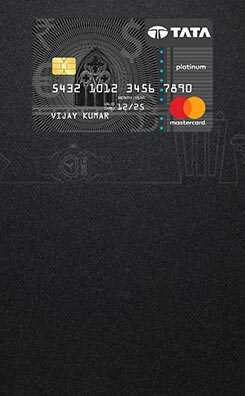 Transfer your outstanding to Tata Card. Save more with lower interest rates & pay back in EMIs. Flexible payment options make your spending delightful and stress-free. Enjoy hassle-free money with convenient repayment options. Credit cards come with legal contracts. Hence, it is important that you are aware of their terms and conditions, when you sign up for them. Explore features and learn about T&Cs: Please read your credit card application carefully to know about your card’s features and associated Terms and Conditions. The information mentioned in small prints may have big impacts on your fees, charges and usage conditions. While some T&Cs are similar on all cards, there are many others that may be particular to the ones you are applying for, so we recommend that you go through all of them. Understand liabilities: If your card has multiple users, know about the liabilities shared by secondary users. Also, if you have applied for Add-on cards, understand the added responsibilities that come with them such as who will manage the cards, pay bills and debts, etc. Know how to cancel your Credit Card: Knowing how to cancel your card is as important as knowing how to use it. When you decide to close a Credit Card, make sure all payments have been made and there are no pending dues. Avoid closing cards that still have outstanding balance to be cleared or those that make a significant amount of your credit history. Cancelling such cards impact your credit score. Learn about cash advances: Credit Cards give you the freedom of taking cash advances. But avail this service only at the time of emergency because cash advances are levied with charges, which you start paying from the day you have taken the advance. There is no grace period on cash advances from a credit card. Exploring lower rate of interest options for payments: In case of unexpected expenses, it is better to talk to your credit card company and explore different options that you can take advantage of, such as availing low interest credit options. This way you can save on the amount you repay. Credit cards give you a lot of power and if you follow some crucial mantras about their usage, you can harness them well. Ensure the safety of your Credit Card, PIN number and security code by all means. Whenever you travel abroad, stay informed about the benefits you can avail in case of card loss or theft, such Card Insurance plans & Emergency Card replacement services. Check your credit card statements carefully for any suspicious transaction. Try to retain the bills of all important and big transactions till you have paid your credit card dues. If you ever notice any unsolicited transaction, immediately report the same. Do not hand-over your credit card to people, whom you do not know. When you shop, make sure you have collected your card at the end of the transaction. Also, before signing the charge slip, check the amount printed on it. Keep your Credit Card, CVV and helpline numbers saved with you separately and in case of card loss or theft, immediately inform your card issuer and get the card blocked. Always log in into your credit card account from a secure computer that is malware free. Make a strong password for the online account of your credit card and do not share your password with anyone. Refrain from responding to correspondences that asks for your Credit Card or password details. Banks or your card issuer, will never ask for this information from you. Whenever you get such mails, calls, SMS, etc. bring them to the notice of your card issuer. Click here for a detailed account on dos and don’ts related to the safety of your credit cards. Credit score is an important factor, which most institutions consider while approving your credit cards or loans. Know how you can maintain a good credit score. Credit score is a numerical expression that establishes your credibility as a borrower. It indicates the probability of default by a consumer on the basis of his or her repayment performance in the past 12 months and is an important factor that determines whether a lending institution will approve your loan or credit applications or not. Higher the credit score, higher is the probability that banks and other lending institutions will approve your loan or credit card application. Know your credit score before applying for a loan or credit card,. In case, if your score is less than what is generally considered by your lending institutions, take necessary measures to improve the score. Limit the number of credit cards you own, since applying for many of them might create an impression that you rely too much on credit, which thus creates a negative impact on your credit score. Make timely payments of your credit card bills. This is one of the most important requisites for a sound credit score. Your credit history plays a very important role in banks and lending institutions to decide whether you should be given more credit. Identify the areas which pull down your credit score and continuously work on them in order to improve your score gradually. A good credit score is a key to a good financial life and it is vital that you build a high score. As per the Know Your Customer guidelines of the Reserve Bank of India*, we need to periodically update customer details and obtain identification documents. You are requested to submit a self-attested copy of the required KYC documents for your Credit Card and for Add-on Cards (if any) at the earliest. For NRI customers, copy of Pan Card/Form 60 is required in addition with the aforesaid documents. Also, in case the documents submitted by a foreign national does not contain the details of address, in such case the documents issued by the Govt departments of foreign jurisdictions and letter issued by the Foreign Embassy or Mission in India shall be accepted as proof of address. ** For Driving Licenses issued in states where it is specifically mentioned that the document cannot be used as address proof the same will not be acceptable as an address proof KYC document.